This is the 12 Seattle Beer News list of the Top 10 Beer Spots in Seattle. Many great bars, pubs, and breweries won’t make this list; that doesn’t mean they aren’t outstanding places. Check out the previous post for #7. 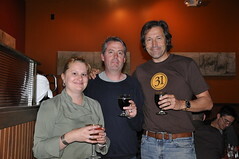 Chef Nicole Burrows, Owner Seth Howard, and David Walker of Firestone Walker Brewing during a Seattle Beer Week beer dinner. Collins Pub is located just on the outskirts of Pioneer Square in an area that isn’t exactly glamorous and isn’t bustling with potential customers every night of the year. But, they give beer drinkers plenty of reasons to visit. It’s a popular spot for drinks before a Mariners game, and their sunny patio is busy whenever we are blessed with sun. The Beer: They do about as good of a job of rotating craft beers and imports here as anywhere else in town. The bar probably has around 20 t0 25 taps, but just about all of them rotate through various styles from breweries all over the map. Owner Seth Howard loves his beers hoppy, sour, or big (high ABV), and that preference often comes through in the tap list. It’s not uncommon to sit down at the bar and find five or more outstanding IPAs that you’ll have to choose from, or you could just have one of each. Collins Pub receives most special release beers being distributed to the Seattle market, and they rarely wait for a special occasion to put those on; they’ll hit the taps pretty quickly. They always have something interesting on tap, and more often than not they are pouring something I have never tried before. When you are in downtown Seattle, there is no better place for a well-thought-out tap list. Some places may have more taps, but Collins does more with what they have. The Food: In addition to the beer, one of the reasons I make Collins Pub my most-visited hangout in town is their food. They offer some interesting dishes, while still having a nice selection of basic entrees. Their steak salad is my fallback order. Their burger (with peppered bacon, of course) is one of my favorites. The fried calamari has been perfectly cooked every time I order it. They have a solid cheese plate, and an even better charcuterie plate. Throw in some proteins (usually steak, salmon, lamb, etc…) with intriguing preparations and you’ve got a winner. It’s not as adventurous as, say Quinn’s, but they stay in their comfort zone and do very well. I’ve also been to several amazing beer dinners at Collins Pub over the years, but special events have kind of fallen off the map for now. The Atmosphere: The room itself is a beautiful spot. Big windows up front allow plenty of light to stream in. A long bar is backed by a huge mirror and lots of hardwood. The back dining room has plenty of booths and room for groups to put tables together. They also have a small patio on the front sidewalk, making it one of the few places with good beer downtown where I can sit outside. The vibe itself can definitely vary, depending on when you go. After work it can get crazy for happy hour, but by 8pm most nights the traffic has died down and the place can empty out by 10pm if there is nothing going on at the stadiums. That is one gripe you’ll hear from some people, if the place is empty they will shut and lock the doors well before the posted closing time of 2am. Not sure I blame them for that, but I feel for people showing up wanting some beer at 11pm. Another gripe you’ll hear about and read in Yelp! reviews is of inattentive service. My advice is to always sit in the bar area at Collins Pub, unless you don’t have the option because it is full. Service usually is better at those tables and it is much easier to grab a servers attention from there, if needed. On game days, this place is just as busy as any other bar in Pioneer Square. Get there early if you want a seat. Overall: I love this place. Since moving to Seattle seven years ago I have enjoyed more nights at Collins Pub than at any other bar, and I’ve sampled many great beers there along the way. First time I had Supplication was here. Always a well thought out beer selection. My go-to spot before Mariners games. Wish I’d known about it sooner. I wouldn’t have wasted as much time at Elysian. Hmm. Press on the Collin’s Pub link and it goes to Miami Beach, FL. Yep – that website used to be for our Seattle Collins Pub…but not anymore. Not sure what happened. I’ve updated that link to their Yelp! page.